Whether you are in your forever home or looking to sell in the future, there is a kitchen update or remodel to suit your needs. The length of time you plan to live in your home and how you plan to use the space will allow us to design a kitchen custom tailored to your exact needs. 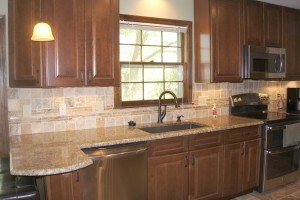 Our kitchen remodels fall into three basic categories – Fresh Updates, Complete Remodel, or Complete Reconstruction. We will talk with you to figure out which one fits your needs. Ken and Connie of Overland Park, Kansas, “As renovation novices, we really appreciated the fact that Chris communicated with us from start to finish. this began with the initial meeting and continued throughout the project. He listened to our ideas and shared his vision. All his staff were dependable and professional as well. The end result of this collaboration was the conversion of a 1990’s kitchen with all its honey oak glory, into a beautiful, functional kitchen. It looks great and works great. It’s not for show–we cook 6 days/week. It’s easy to tell that Chris takes pride in his work and has integrity. Our kitchen is a testimony to that. How often does your family cook at home? How often do you casually or formally entertain? How do you use your cabinet and counter space? Are you in need of expanded storage capabilities? Maybe an extended pantry? What are your biggest limitations in your current kitchen? Redesign features may include removing walls and expanding into another room, combining the space with a dining room, or opening up a half wall to create a breakfast nook, bar, or buffet space. If extra storage space is what your remodel needs, we can add new cabinetry. 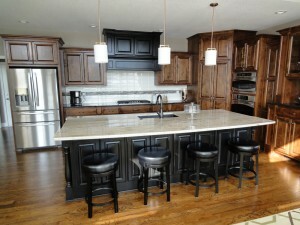 New cabinetry is one of the favorite features our clients enjoy. A wine cabinet or baking sheet storage cabinet makes staying organized easy. A trash bin or recycling pull-out drawer keeps the kitchen neat. A walk-in or larger pantry keeps meal planning convenient and reduces food waste. And since there’s never enough counter space in a kitchen, we can expand your counter space by adding an island or peninsula. Lighting – Lighting is a great way to liven up a room; whether you are looking for natural light from a new window or additional light fixtures. New Sink – An updated sink can be just the right amenity to bring a touch of modern class to your kitchen. Relocating the sink to a different area of the countertop or island is also a possibility. New Backsplash – Installing a tile or granite backsplash adds a unique decorative feature that can dramatically change the look of your space. 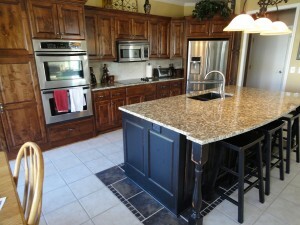 Our goal at CMP Construction is to transform your kitchen into the kitchen of your dreams. We strive to ensure the room flows seamlessly with the rest of your home. We want your family to have the best kitchen to suit your home, lifestyle and everyday needs. Give us a call at (913) 839-9234 to schedule your complimentary in-home consultation. 1796 E. Kansas City Rd.